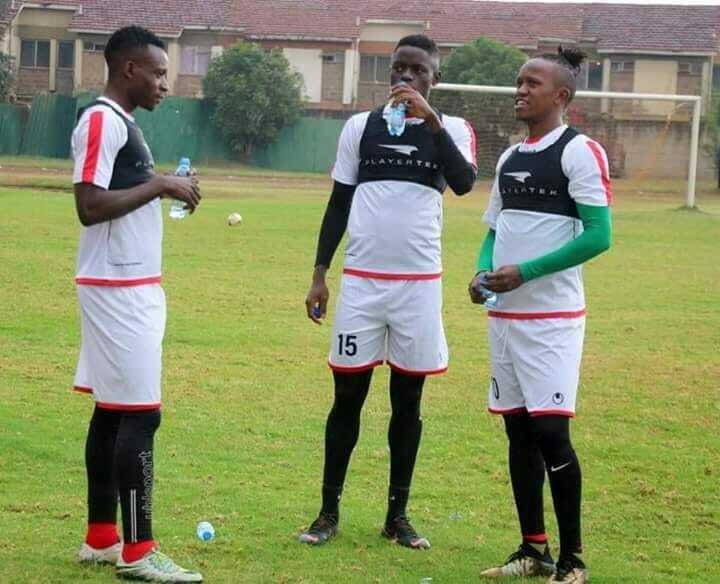 Players who currently play for Gor Mahia or have previously played for Gor Mahia formed the bulk of the squad named by Harambee stars coach Sebastian Migne. Stars are due to play Ghana Black Stars in a 2019 Africa Cup of Nations (Afcon) Group “F” qualifier at Kasarani Stadium. The Kogalo players in the squad are Philemon Otieno, Joash Onyango and Francis Kahata. The former Kogalo players are Eric Ouma, Anthony Akumu, David Owino, Musa Mohamed and Michael Olunga. Kenya lost their opener away to Sierra Leone, therefore a win is crucial if they are to keep their hopes alive. One Kogalo player who is sure to be in the starting line-up is the in-form Francis Kahata. Kenya has never played Ghana in a competitive match. All the previous matches have been friendlies. Ghana is responsible for inflicting the heaviest defeat Kenya has ever suffered (13-2) in 1964. That was the only time former president Jomo Kenyatta ever attended a football match and he left in a huff at halftime as Ghana started to run up the score. Before he left, he cried out in despair: “Why can’t they bring in Kipchoge Keino to run past these Ghanaians. “. MwendwA asks Kerr to explain his comments. My personal opinion and reply: cheetah!!! Kenyan players are handled carrier destroying coaches. Unfortunately I do not see Kenya going anywhere. Most of the players listed are not necessarily bad but their attitude and technical awareness is as shallow as can be. The Harambee stars coach has also not “perused” the country to search for players but has left Stanley Okumbi to continue bringing in his “guys”. It is high time Kenya stopped bringing in some of these so called professionals from abroad. They have added no value to the Kenya game. Wanyama’s impact on Harambee stars has been very little. Apparently the Kenya team is more about pausing and comparing weird hairstyles. Apart from Matasi, Kahata, Phillemon Otieno, (Eric Ouma), (Aboud Omar), Olunga and Were I would drop the rest of the lot and go search in the villages. I would also add a fit Wellington Ochieng and Peter Odhiambo the goalie. Were and Olunga are two good strikers but with very different approaches. Substituting them blindly affects the team. Olunga is more an impact player and works well with those around him. Were is more of a finisher and relies on a good feeder who understands him. Eric Ouma and Aboud Omar are probably the two best defenders Kenya ever produced recently but again the path they chose was not good necessarily career building… but with a keen coach these two could fit any African side. I am not sure about them anymore. Coach Migne has his work cut out. This is why we bring in foreign coaches. I remember he could not beat India. I hope this is not why the Ghanians were laughing at the airport. @Dinga, surely Wellington Ochieng do not deserve to be in the national team now. … true, that’s why I said a FIT Wellington Ochieng. Bro, i know you are as passionate as the average fan can be, but aren’t you being too hard? Maybe first let the game be played and then do a critique! Football, is a funny game and anything can happen. What if Kenya wins the game, wouldn’t that be egg on your face? Wishing the Harambee stars the best of luck in the field of play. If Kenya wins then it’s a fried egg on my face and I can live with that. My problem is the “what if”. Why must Kenya vs west, north or south always be a what if Kenya wins. When will Kenya ever face Egypt or Senegal on a 50 50 basis. That is what i’m trying to bring out. The current arsenal of coaches n players are an incompetent lot n all they have ever provided is “what if”. If Kenya wins tommorow it will be considered an upset for Ghana rather than a win for Kenya. The mistakes Kenya has continued to make over the years have solutions so to bring the same performers into the stage and expect anything different is what we apparently call stupidity. I have not seen the coach do anything defferent, I have not seen Fkf do anything different and the worst of the lot, I have not seen Kenyan coaches making any new(they were whitwashed hy Kerr) impact so I expect the same results. I hope this time we have till the next season starts we use it wisely to scout for players locally. We are lucky that we are no longer under any pressure and can therefore watch the players who can sustain the current pressure of avoiding relegation, winning the shield or becoming second to Gor. If we don’t get our act together early enough I foresee us having challenges in the shortened CAF league and KPL next year. Once and if Tusker, Sofa and Ingwe get their act together we will then have to work hard to get the results. Players like Dancun of ingwe, even Isuza, Farouk, Calabar Jnr , Okare of Sofa , even Waruru will be the caliber of player we will need next season. That is my opinion and it could be wrong. If you look at the squad you will notice that the bulk of the players in the camp are former Gor mahia fc player and at the same time they are luopeans. So if we don’t give our boys a chance then it means that Gor mahia fc players and former Gor mahia fc players who be on the first eleven are not good enough to give the country a vital win. Even in goal I would have preferred Frederic Odhiambo to the match day goalkeeper but since he was not considered I will hope that ian Otieno to be the match day goalkeeper and not Matasi. If that coach will make a mistake and name matasi as the match day goalkeeper, then I can bet that Kenya will loose 2-1 to Ghana. Matasi of this season cannot be relied on his move to tusker did not help him improve. He has been soaking in goals in tusker just like he was making posta rangers to loose crucial matches. He was in goal when Kenya lost to India by 3-0. His record is very bird. So the coach should use Ian or shikalo but not Matasi. I find that your comment is deeply cheapened by the tribal angle. Why do you find it necessary to count Luos in the team? And who are these Luos that you mention playing for? Gor Mahia, Nyanza or Kenya? Associating Luo’s with the ownership of GorMahia n football in general is detrimental to the club. Many ppl say Gor is a big club. Is it really? Or is it a tribal outfit trying to pass itself as a club? The many times Gor has been bailed out financially, is it Luos who have come up with the money? It’s not my wish to sound tribal but look at the squad and tell me how many luos are in that team. And if they are not good enough then tell mwendwa to inform his coach to desist from those with names starting with o. Surely Michael, with all due respect what you are mentioning is not necessary and will only contribute to disharmony. Remember soccer is teamwork and brings us all together irrespective of the tribe. Am not talking about Gor mahia in this case,what am talking about is this negative attitude where nobody is giving the national team a chance yet majority of the players who will be on match day squad at either from Gor mahia or former Gor mahia players.if the team is not good then let them avoid the players from Gor mahia. What I mean hear is that if luos are not good enough to play for the national team, then they should not be fielded .if anybody thinks that am tribal because I believe that stars can pull a surprise win, so be it. Matasis form everybody knows that is down, if I say that he should not be fielded,it’s not that am tribal, it’s just that am concerned that we might end soaking in goals in our backyard. Now That Stars Have Won Where Is This Dinga With His Obnoxious Negativity? As Alwar Predicted “egg On Your Face”. Bure Kabisa!